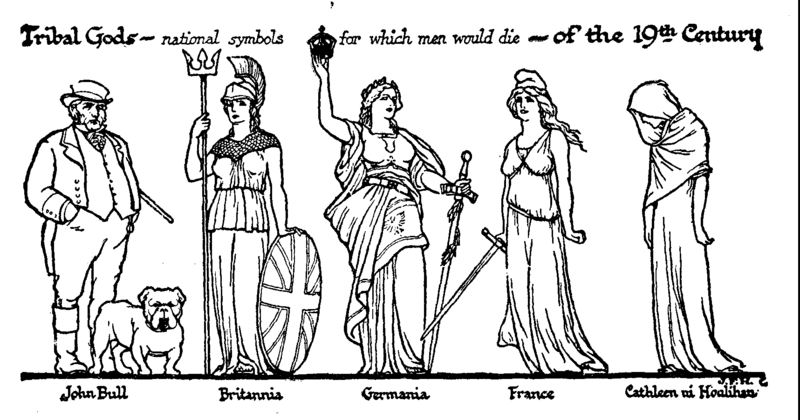 Symbols for which men would die. We have already pointed out that there must be a natural political map of the world which gives the best possible geographical divisions for human administrations. Any other political division of the world than this natural political map will necessarily be a misfit, and must produce stresses of hostility and insurrection tending to shift boundaries in the direction indicated by the natural political map. These would seem to be self-evident propositions were it not that the diplomatists at Vienna evidently neither believed nor understood anything of the sort, and thought themselves as free to carve up the world as one is free to carve up such a boneless structure as a cheese. Nor were these propositions evident to Mr. Gladstone. Most of the upheavals and conflicts that began in Europe as the world recovered from the exhaustion of the Napoleonic wars were, quite obviously attempts of the ordinary common men to get rid of governments that were such misfits as to be in many cases intolerable. Generally the existing governments were misfits throughout Europe because they were not socially representative, and so they were hampering production and wasting human possibilities; but when there were added to these universal annoyances differences of religion and racial culture between rulers and ruled (as in most of Ireland), differences in race and language (as in Austrian North Italy and throughout most of the Austrian Empire), or differences in all these, respects (as in Poland and the Turkish Empire in Europe), the exasperation drove towards bloodshed. Europe was a system of governing machines abominably adjusted. From the stresses of this maladjustment the various «nationalist» movements that played so large a part in the history of the nineteenth century drew their driving force. What is a nation? What is nationality? If our story of the world has demonstrated anything, it has demonstrated the mingling of races and peoples, the instability of human divisions, the swirling variety of human groups and human ideas, of association. A nation, it has been said, is an accumulation of human beings who think they are one people; but we are told that Ireland is a nation, and Protestant Ulster certainly does not share that idea; and Italy did not think it was one people until long after its unity was accomplished. When the writer was in Italy in 1916, people were saying: «This war will make us one nation». Again, are the English a nation or have they, merged into a «British nationality»? Scotchmen do not seem to believe very much in this British nationality. It cannot be a c ommunity of race or language that constitutes a nation, because the Gaels and the Lowlanders make up the Scotch «nation»; it cannot be a common religion, for England has scores; nor a common literature, or why is Britain separated from the United States, and the Argentine Republic from Spain? We may suggest that a nation is in effect any assembly, mixture, or confusion of people which is either afflicted by or wishes to be afflicted by a foreign office of its own, in order that it should behave collectively as if it alone constituted humanity. We have already traced the development of the Machiavellian monarchies into the rule of their foreign offices, playing the part of «Powers». The «nationality» which dominated the political thought of the nineteenth century is really no more than the romantic and emotional exaggeration of the stresses produced by the discord of the natural political map with unsuitable political arrangements. Throughout the nineteenth century, and particularly through out its latter half, there has been a great working up of this nationalism in the world. All men are by nature partisans and patriots, but the natural tribalism of men in the nineteenth century was unnaturally exaggerated, it was fretted and over-stimulated and inflamed and forced into the nationalist mould. Nationalism was taught in schools, emphasized by newspapers, preached and mocked and sung into men. Men were brought to feel that they were as improper without a nationality as with out their clothes in a crowded assembly. Oriental peoples who had never heard of nationality before, took to it as they took to the cigarettes and bowler bats of the west. India, a galaxy of contrasted races, religions, and cultures, Dravidian, Mongolian, and Aryan, became a «nation». There were perplexing cases, of course, as when a young Whitechapel Jew had to decide whether he belonged to the British or the Jewish nation. Caricature and political cartoons played a large part in this elevation of the cult of these newer and bigger tribal gods—for such indeed the modern «nations» are—to their ascendancy over the imagination of the nineteenth century. If one turns over the pages of Punch, that queer contemporary record of the British soul, which has lasted now since 1841, one finds the figures of Britannia, Hibernia, France, and Germania embracing, disputing, reproving, rejoicing, grieving. It greatly helped the diplomatists to carry on their game of Great Powers to convey politics in this form to the doubting general intelligence. To the common man, resentful that his son should be sent abroad to be shot, it was made clear that instead of this being merely the result of the obstinacy and greed of two foreign offices, it was really a necessary part of a righteous inevitable gigantic struggle between two of these dim vast divinities. France had been wronged by Germania, or Italia was showing a proper spirit to Austria. The boy’s death ceased to appear an outrage on common sense; it assumed a sort of mythological dignity. And insurrection could clothe itself in the same romantic habiliments as diplomacy. Ireland became a Cinderella goddess, Cathleen ni Houlihan, full of heartrending and unforgivable wrongs; young India transcended its; realities in the worship of Bande Mataram. The essential idea of nineteenth-century nationalism was the «legitimate claim» of every nation to complete sovereignty, the claim of every nation to manage all its affairs within its own territory, regardless of any other nation. The flaw in this idea is that the affairs and interests of every modern community extend to the uttermost parts of the earth. The assassination of Sarajevo in 1914, for example, which caused the great war produced the utmost distress among the Indian tribes of Labrador because that war interrupted the marketing of the furs upon which they relied for such necessities as ammunition, without which they could not get sufficient food. A world of independent sovereign nations means, therefore, a world of perpetual injuries, a world of states constantly preparing for or waging war. But concurrently and discordantly with the preaching of this nationalism there was, among the stronger nationalities, a vigorous propagation of another set of ideas, the ideas of imperialism, in which a powerful and advanced nation was conceded the right to dominate a group of other less advanced nations or less politically developed nations or peoples whose nationality was still undeveloped, who were expected by the dominating nation to be grateful for its protection and dominance. This use of the word empire was evidently a different one from its former universal significance. The new empires did not even pretend to be a continuation of the world empire of Rome. These two ideas of nationality and, as the crown of national success, «empire», ruled European political thought, ruled indeed the political thought of the world, throughout the latter half of the nineteenth century, and ruled it to the practical exclusion of any wider conception of a common human welfare. They were plausible and dangerously unsound working ideas. They represented nothing fundamental and inalterable in human nature, and they failed to meet the new needs of world controls and world security that the mechanical revolution was every day making more imperative. They were accepted because people in general had neither the sweeping views that a study ofworld history can give nor had they any longer the comprehensive charity of a world religion. Their danger to all the routines of ordinary life was not realized until it was too late.